Covington, TN - Charms Boutique™ introduces Premium Lollipops with a creamy natural vanilla center. Genuine flavor profiles that blend decadent dessert flavors and popular trends with ribbons of sweet creamy goodness. Like works of art, these colorful pops are swirled to perfection. 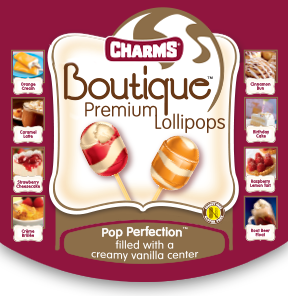 Flavorful and beautiful, Charms Boutique Premium Lollipops are Pop Perfection™. 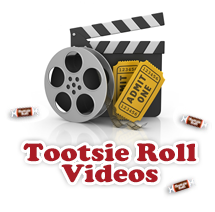 Eight fabulous flavors are available: Crème Brulee, Root Beer Float, Cinnamon Bun, Raspberry Lemon Tart, Birthday Cake, Orange Cream, Caramel Latte, and Strawberry Cheesecake. In a world where most lollipops are for kids, Charms Boutique Pop is a cut above. 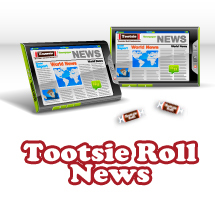 It is inspired by gourmet flavors and a dedication to the highest level of confectionery quality. 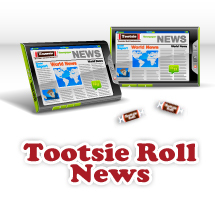 Our Pops are Peanut and Gluten Free, Kosher Certified and in true Tootsie Roll Industriestradition – Made in the U.S.A.